Maria, an 85-year-old white female, presented with with double vision. She ﬁrst noticed the problem 15 years prior to our initial meeting. She was ﬁrst prescribed compensating prisms at the age of 76. Maria’s double vision became much more noticeable and therefore problematic because the second image was much clearer following two cataract surgeries, one month apart, at the age of 78. The compensating base out (BO) prism in her glasses had increased from 9 to 20 prism diopters over a 4½ year period. When the double vision re-emerged with 20 BO already in place, Maria was told that they could not prescribe stronger prisms and that surgery was the only possible solution. Not being a fan of allopathic medicine, surgery was not something Maria was willing to consider. Maria takes no medications, eats very healthy home-cooked meals, and has had minimal contact with doctors throughout her life. It took signiﬁcant coaxing to get Maria to agree to cataract surgery. Three different surgeons told her that the only way to eliminate her double vision was eye muscle surgery. Maria balked, ﬁnding it quite odd that none of these doctors had anything other than surgery to suggest. She just could not believe that this could be true. Maria found me only after a lengthy search for something other than what she had been told was the only possible way to ﬁ x her problem. Her search brought her into contact with Dr. Sue Barry, who told her that there was most deﬁnitely something else to try. When Maria called my ofﬁce and I answered the phone and then all of her questions, she was ready to try vision therapy. She is a very personable and energetic woman, and Maria was excited to try something other than surgery and the massive prisms that had been her only hope to this point. As it turns out, the prisms were doing quite a bit more than tricking the visual system into behaving as though the two eyes were aiming and working in an integrated and efﬁcient manner. I talk about the visual system and the visual process. This for me is simply a matter of convenience in discussing various issues, although it can admittedly get a little messy. It may not be so easy to decide where process ends and system begins. I will describe the visual system as the structures and mechanics used to gather visual information: eyeballs, eye muscles (intra- and extra-ocular), and biological lenses. It was from Dr. Robert Kraskin that I ﬁrst learned that the visual process is the deriving of meaning and the directing of action as a result of a select band of radiant energy entering the eyes. The term visual process describes how we understand our environment and how we create and use our internal representation of the external world— how our bodies are oriented in space, how we might want or need to interact with other aspects of our immediate environment, identifying what other items are available for interaction, how to manage the time and space involved with interacting, and how we communicate our impressions of the world to others. Our evaluation of the visual process should reﬂect these issues as we look to understand how the person in our chair does all these things. We want to know how the person uses the enormous potential of the visual process to derive meaning and direct action. The system serves the process, not the other way around. That is, the appropriate processing of information is necessary for the equipment to operate efﬁciently and effectively. It is not necessarily the other way around. There is really only one risk in attempting vision therapy with someone who has adapted to their strabismus—intractable diplopia. The ability to suppress an image is a useful skill when your options are limited. Diplopia is unpleasant and creates many difﬁculties throughout one’s daily life. Constant suppression is probably better since it is a consistent state. Intermittent and/ or alternating suppression is less efﬁcient in that regard and likely takes more effort. Awareness of the diplopia is an important phase in achieving more a sophisticated level of binocularity. More sophisticated binocularity is the surest way to ocular alignment. Unfortunately, it is possible to end up stuck in the middle, with constant diplopia. It is rare, but it should be a consideration at the start of therapy in these situations. We should immediately see a red ﬂ ag regarding Maria’s pre- and post-cataract surgery prescriptions. Maria had signiﬁcantly anisometropic nearsightedness prior to her cataract surgery but appears to have become farsighted after. This in itself can be very confusing visually. She had spent a lifetime being nearsighted only to have her refractive status switched to hyperopia as a result of cataract surgery. Refractive status is one of many integral aspects of a person’s visual proﬁle and style. 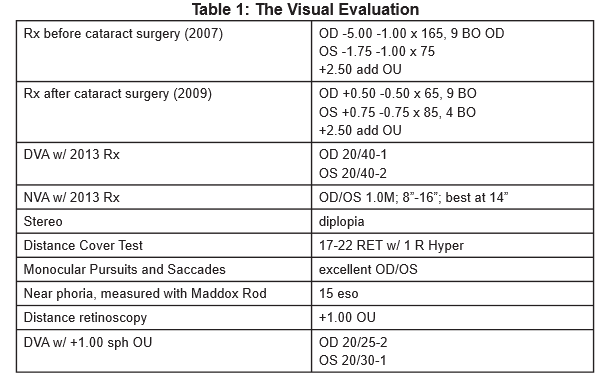 Just as the confusion resulting from a post-surgical esotrope ending up with exotropia creates considerable difﬁculty for the recovery of binocular function, changing someone from a lifetime of nearsightedness to the sudden onset of farsightedness, well into presbyopia, can also cause considerable uncertainty in general visual function, possibly exacerbating other visual issues. While it might, on the surface, seem desirable to have gotten her so close to plano at distance, crossing over from minus to plus probably did more harm than good. Did you notice something missing from this evaluation? It was not completely absent from the preceding description, but not formally included in the evaluation section above. I am referring to the patient history. The patient history is often the most important piece of information available. Patient history is very likely the ﬁrst bit of insight we gain into the person’s situation, goals, and prognosis. I have seen many people whose ﬁndings, after the history, do not seem to add up to what the history has revealed. Some people have adapted and compensated so well, so completely to their visual difﬁculties that the ﬁndings look much better than the complaints with which that person presents would lead you to expect. Maria knew that vision therapy was her treatment of choice. She strongly believed that surgery should only be a last resort. She was excited to try a more dynamic and interactive approach, having already experienced what compensating prism as stand-alone treatment provided. I agree with Maria that surgery should be a last resort. I think that compensating prism should be a close second-to-last. Vision therapy is the treatment of choice for almost all types of strabismus. Vision therapy is necessary to help develop a new style of binocularity, whether or not surgery (or compensating prism) is determined to be a useful adjunct. I used the phrase new style of binocularity above. This is important to understand. People with strabismus are binocular; they are just binocular in a different way than we would expect or desire. A type of binocularity exists even under conditions of suppression of binocular vision, especially if the suppression is intermittent and/ or alternating, or if it is a partial suppression such as central suppression that allows for peripheral vision to remain active in that eye. Similarly, when a person’s eye is occluded, they should not be thought of as monocular. They are still behaving as binocular individuals, just with one eye occluded. We still expect both eyes to accommodate, converge, etc.—patch or no patch. Strabismus is best thought of and managed as a variation of binocularity. Lenses are most often used to compensate for reduced acuity, to create ocular alignment in cases of accommodative esotropia, or to create ocular alignment in the presence of any strabismus. Lenses can be used in more dynamic ways. Lenses change the feedback to the brain in any event. The brain must make adjustments for any lens to have an effect, whether to effect improved acuity, to over-ride accommodative demand, or to compensate for misalignment of the eyes. Compensating lenses are designed to address issues of the past by doing work that the brain has been incapable of managing. They typically address obvious symptoms, but they do little or nothing to address the causes of the symptoms. Imagine treating a broken leg with nothing more than aspirin to stop the pain. Pain is an obvious symptom, but the fracture itself must be treated if normal function and structure are to be returned. Lenses that simply restore normal acuity do nothing to treat the possible causes of this symptom. In fact, they often help to exacerbate the underlying conditions. Compensating lenses stiﬂe visual development by acting as a crutch; this interferes with the brain’s potential to improve its fundamental functions. Therapeutic lenses address the future by catalyzing the brain’s ability to change the way it processes information. It has been my experience that changing a person’s habitual compensating prescription is usually the best ﬁrst step in the therapy process. Maria started vision therapy the week after her initial evaluation. At that visit, we determined that Maria could maintain single simultaneous binocular vision out to 22” with +1.00 spheres and 5 BO in each eye. The following week we decided to try +1.00 w/ 6 BO in each eye and +2.25 add OU. This was dispensed at Maria’s third VT session. I had Maria keep her old prescription. I assumed this new prescription would be challenging, going from 20 to 12 BO in one move. The plan was to have her wear the reduced prisms as much as possible with the intention of gradually reducing the amount of prism, so I decided to err on the side of caution and utility. As should always be the case, each prescription should be the result of a negotiation between doctor and patient. In this case we decided not to push too hard, too soon with the hope of making the transition more tolerable while providing a greater range of comfortable vision. One of the ﬁrst things I do with almost every VT patient is to change their habitual prescription. Most prescriptions are based solely on acuity or cosmetic alignment of the eyes. These compensating lenses are based on what has happened in the past. They are a response to the patient’s response to their visual issues, which are rarely just about acuity. I want to help people break patterns that are either wholly or in part unsuccessful, which is why they are in my ofﬁce in the ﬁrst place. I want them to be using lenses that are designed to help them change their old patterns and move forward in a positive direction. In Maria’s case, I knew that her old prisms would be working against the internal changes we were trying to encourage with vision therapy. She needed something that would allow her visual process to develop along a new trajectory. Maria reported being able to wear the reduced prism prescription for only one to two hours, three to four times a day for the ﬁrst week. By the second week, she reported wearing them almost full-time, only relying on her old glasses for brief, speciﬁc situations. While it is possible that cosmetic alignment of the eyes via surgery and/or compensating lenses/prisms can have a positive impact on the development of the visual process, I am more interested in determining what the person is capable of doing themselves. Vision therapy provides the appropriate conditions under which a person can explore the nature of their visual process in order to develop new habits and patterns of processing visual information for the purpose of directing action. A crutch might be an important aspect of protecting an injured leg during the healing process, but physical therapy is necessary to return the injured muscles to a condition needed for normal function. Similarly, surgery and/or compensating lenses might be a necessary aspect of improved visual function, but these in and of themselves are unlikely to provide the conditions necessary for continued development of the visual process for use under the varied and dynamic conditions inherent in our daily lives. I am always looking for ways to use lenses as catalysts for change, rather than simply using them as crutches. After six weeks with her new prescription, Maria informed me that she noticed that she was seeing better at distance without lenses than with them. I found this a little hard to believe, but the testing veriﬁed Maria’s claims. She was seeing almost a line better without lenses. This brings up something that I believe is important but is probably quite different than what you have been told so far: optimal acuity should be thought of as a result of a well-functioning visual process, not a prerequisite. I have found that VT often leads to improved distance acuity. I think this is because the person becomes able to make better use of the available information as the visual process becomes more sophisticated and effective as a result of vision therapy and/or a more strategic, dynamic use of lenses. Approximately three months into therapy, since Maria was wearing her reduced prism prescription most of the time, I prescribed +0.50 w/ 3 BO in each eye with a +2.25 add OU. This provided appropriate distance and near acuities/ranges but was difﬁcult due to the reduced prisms. It took Maria seven more months to begin using this prescription on a fairly consistent basis: by this time she was rarely using her original prescription. I am still working with Maria at the time of this writing. We will continue trying to decrease the strength of her prisms while increasing the ﬂexibility and durability of her visual system and regaining the quality of life her old prism glasses had taken away. So far so good. On the morning of Maria’s 21st VT session, I noticed something was very different. She was standing up perfectly straight. She has stayed that way for the six months since. For me this seemed to be a quite sudden change. I did not notice this happening gradually. Just as I said, she came in one morning with what to me was drastically different posture. It was then that I realized why she was hunched over in the ﬁrst. All that BO prism was collapsing Maria’s world, and not just her visual world. After a few more sessions, Maria started saying that she was ﬁnding it easier to get around. She was more conﬁdent of where she was in space and more conﬁdent of what her feet were doing. Maria realized that she had become gradually less and less able to navigate unfamiliar terrain as her prisms increased until, by the time we met, she generally needed to hold onto her husband’s arm to get around the mall or to navigate uneven terrain. We talked about this and discussed the fact that Maria’s peripheral awareness had been all but eliminated by the prisms. This was the beginning of the realization of just how drastically Maria’s life had been altered by the constant, long-term use of such strong prisms. While there may have been some beneﬁt to the prisms, which is by no means certain, there was a signiﬁcant down-side. Little by little Maria’s movement and posture were being restricted. It was a gradual process and so went unnoticed for the most part, though Maria’s records show that she repeatedly told her doctors that the prisms were affecting her equilibrium. It wasn’t until using the weaker prisms and vision therapy that she and her husband were able to process just how much things had changed and how much better they could be again. My intention with VT was, as always, to stimulate and to help develop all aspects of the visual process: pursuits, saccades, ﬁxations, convergence and divergence, accommodation, peripheral awareness, etc. It is important to understand that all aspects of the visual process should be included in a successful program of VT. For example, it is not widely appreciated that an esotrope might have become that way due to an inability to converge the eyes properly. I was taught that esotropes simply do not know how to diverge their eyes and therefore only need to work on divergence. Do not get caught in this trap. I was taught that there is a strict hierarchy to a VT program; ﬁrst monocular activities, then bi-ocular, then monocular in a binocular ﬁeld, and ﬁnally binocular. I learned about computer orthoptics, vectograms, tranaglyphs, the Brock string, lens ﬂippers, and compensating lenses/ prisms. I never heard much about bimanual chalkboard circles, tachistoscopic activities, yoked prisms, Harmon walking rail, or other motor activities while in school. These emerged as important therapy techniques only after I spent time observing experienced optometrists doing therapy. I was never formally taught anything about therapeutic lenses that could stimulate the visual process, not just act as a crutch—what I often refer to as the strategic use of lenses. I have spent very little time following the rules I was taught, though they are certainly part of the foundation of my model of vision. I do have some activities that I typically do in sequence, but I do not follow very strict rules as far as my overall therapy process. What is difﬁcult for one person might be very easy for another, so it is best to be ﬂexible. I should add here that unlike most practices these days, I do not have any therapists. I do all therapy personally. I feel that vision therapy is too important to delegate. I am sure this reduces the number of people I can work with each week, but I ﬁnd it very gratifying to watch people’s progress ﬁrst-hand. And I like to think that I can make adjustments to the program on the ﬂ y in a way that is unavailable to most therapists. I believe it is also important to engage patients in dialogue in order to help them process what is going on in therapy and in order to help me better to understand how they use their visual process and how best to help them to move forward. I do not use any computers in my therapy. Computers are the cause of so much visual stress that I don’t feel the need to use them to solve people’s visual problems. I do use a wide variety of lenses and prisms in my therapy. Although this is clearly impractical, I would like to attempt every VT procedure that I am going to use throughout the therapy program during the ﬁrst session so that I might compare performance before and after. I like to see improvement on procedures, not because of repetition alone, but because the visual process has attained overall improvement. It is one thing to improve because of practice, but it is another to improve because visually guided performance has achieved a new level of sophistication. I believe this is analogous to the improvement we see in the therapy room transferring over to the real world. I do not use as many procedures as most of my colleagues. I have come to learn that more procedures tend to clutter things up. This is particularly true if you are continually adding new procedures. When you start using a new procedure, you are reducing your effectiveness in the most important aspects of what a therapist should be, which is a keen observer and guide. Each new procedure demands that you learn everything you can about it, so there is some period of time when you are busy acclimating yourself to the procedure instead of simply doing therapy. It is important to have a consistent instructional set for each procedure, if only to know that you are actually doing the same procedure each time with each individual. The instructions should provide information necessary and sufﬁcient to carry out the task. What a person does in response to the instructions is itself instructive to the therapist’s understanding of that person’s visual process and personality. Words of wisdom: people will change the instructions to survive the task. As much as we might hope or attempt otherwise, every procedure calls into play every aspect of the visual process. Some can be thought of as emphasizing one aspect over another. For example, vectograms are used to assess, stimulate, and direct the development of binocular vision. However, vectograms cannot be done without the cooperation of the accommodative and oculo-motor systems. You cannot understand where something is without the two eyes pointing at the appropriate area of space, and you cannot have an accurate assessment of what the thing is without a certain degree of accommodative accuracy. I would also add that nothing visual takes place without the foundation of peripheral visual awareness. As mentioned earlier, occluding an eye does not negate binocular behavior. Another important aspect of being a good practitioner and/or therapist is the understanding that even when you are testing someone, you are likely providing at least a little bit of therapy. Sometimes people begin their healing process at the initial evaluation because they realize, consciously or otherwise, that they are ﬁnally with someone who understands their problem in a way that no one else has. I see this happen with children who have been struggling in school for years, with various interventions having been tried to little or no avail. This is typically because nobody else ever thought about the importance of the visual process and visual development in relation to their difﬁculties. Similarly, there is much to learn about a person as they engage in our various VT procedures. So, every testing procedure has the potential for therapeutic value, and every VT procedure has the potential to add to our understanding of the patient. I do not require a regular regimen of homework. There are several reasons for this: 1) Children needing VT already have more than they can handle on their plates; 2) I do not want parents overseeing therapy because they are too emotionally involved and because they are very likely to be more interested in immediate results than in the process; 3) Vision therapy should be about changing the way a person uses the visual process. We should be interested in posture, working distance, stress levels, breathing, etc. A person doing vision therapy by themselves cannot simultaneously carry out the task and monitor the aforementioned aspects of performance appropriately. My homework mainly consists of using the lenses that have been prescribed as part of the therapy program. I include monocular work with all my patients, whether or not there is an explicit binocular diagnosis. The person will be better able to integrate the two inputs (eyes) by having meaningful monocular experiences. Monocular activities provide the brain with information about each channel (eye) that cannot otherwise be obtained since throughout our daily routines we are consistently trying to use the two eyes in the most effective way possible under our habitual binocular conditions. No two eyes see exactly the same: colors may be slightly different, acuity, size, spatial discernment, etc. The system can work better if the nuances of each input are understood more clearly. 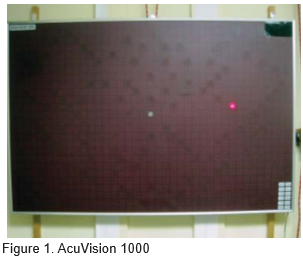 Acuvision 1000 is a wall-mounted 46” x 30” electronic touch-screen that displays one one inch diameter lighted target at a time (Figure 1). The goal is to hit each target as quickly as possible, which causes the next target to appear. The targets can be programmed to appear in sequence or randomly located. A variety of speed settings are available so that the length of time each target is displayed can be changed as desired. This unit is no longer being produced, but there are other similar devices available. This is an activity that has something for everyone. First, it is typically done in a standing position and requires direct eye/hand integration. I like this type of equipment because it involves standing, movement, eye/hand coordination, peripheral awareness, and reaction time. Smaller children will have more of a tendency to ﬁxate each target rather than relying on peripheral vision, but this still provides some quality interaction. Optimally, the patient should have eyes straight ahead using only peripheral vision to locate each target. I also like to use red/green ﬁlters with this so that only one eye can see the target while both eyes are able to see everything else. This has been especially helpful in Maria’s case since she has been suppressing her right eye quite a bit. Her ﬁ rst attempts at integrating precise motor responses with the right eye leading the way were very challenging. She has shown improvement with each successive attempt. 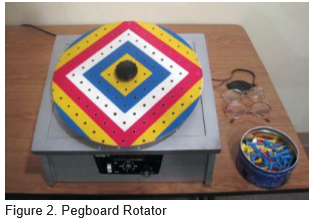 The pegboard rotator (Figure 2) is a fairly familiar piece of equipment. It seems that many doctors/ therapists just start this thing spinning and ask patients to put pegs in the holes. I have much more in mind when using this procedure. For example, with an emmetropic non-presbyope I typically have them start with -1.00 and the left eye occluded and then repeat with the right eye occluded. Next I have them use +0.50 with each eye. Finally, they will remove the pegs one-by-one as the wheel rotates. Each time this activity is done, both the minus and the plus lenses are increased slightly— if all has gone well the previous time. The instructional set is: “Take one peg and hold it near your chin. Pick a hole to aim for, and look right into that hole. When you feel that you know where you are aiming, try to put the peg into that hole without you or it touching the board and without making any adjustments if you notice you are off target as the peg gets close to the hole. If you miss, start again and take as many tries as you need to get it in without contacting the board.” I explain that this appears to be the simplest of tasks, but actually is quite difﬁcult if done according to the instructions. I also remind them that mistakes are an essential aspect of learning and improving. Here I am reminded of something Dr. Gregory Kitchener uses in his ofﬁce and shared with me: “My job is to make this a safe place for you to make mistakes, your job is to make as many mistakes as necessary to complete the task I’ve laid out for you.” This is important since we are often afraid to make mistakes. As children, many of us had to deal with teachers who chided our mistakes and made us feel bad for having made them. This is absurd. Mistakes are essential for growth and development. The only caveat is that we do need to recognize and learn from our mistakes. But make them we must. 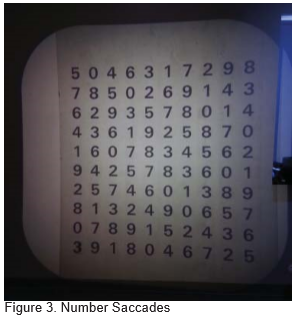 A 10 x 10 number grid is projected on the wall (Figure 3). The numbers end up being about 10 cm high. I have the patient seated about 2 m away, and the instructions are: ”Starting on the top row, I want you to say the ﬁrst number, then the last number, then the second number, then the next-to-last number— starting at the ends and working your way back to the middle.” I have them do the whole chart that way, then repeat the pattern vertically: top number, bottom number, etc. Then I have them switch the patch and do the whole thing with the other eye. Once able to accomplish this with accuracy and rhythm, I have them do this (not on the same day) with a metronome. The ﬁrst speed is 40 beats per minute (bpm). I have found that most people ﬁnd it challenging to keep a rhythmic performance going at this speed. I feel that, in general, people ﬁnd it challenging to do things at a different speed than the one they are accustomed to, whether it be faster or slower. They are still asked to do one eye at a time at 40 bpm. Once they master this speed, the next time I try 60 bpm or so, and typically they are unoccluded from this point forward. I have my vectograms suspended from the ceiling using the clear slide holder, with the height being easily adjusted. This allows me to have the person standing upright (or seated if need be) with the vectogram at eye level for that individual. My ﬁrst question is always, ”What do you see?” After they describe what they notice, I will ask about any suppression and, if need be, about their appreciation of depth. I want them to describe what they see and also to show me where in space they perceive various aspects of the picture to be by pointing to the exact point in space where they see it hovering. The clear slide holder provides the opportunity to localize crossed-disparity projections in real space behind the plane of the slides. Once it appears that the description (including location, size, and clarity) and actual localization are accurate and consistent, I use the following Spirangle vectogram activity. 2. Once the cycle is completed, I have them look away, then recover fusion, and then point to ”E” and ”I”—the farthest and closest letters in the spiral. 3. Change to an uncrossed disparity (BO) setting and repeat the sequence. Next is a crossed dispartiy (BI) setting. Each time the activity is done, I increase the amount of both crossed and uncrossed disparity, alternating between the two, usually doing two rounds of each. This is typically done with habitual near lenses, but this may be modiﬁed depending on the particulars of the situation. Side note on vectograms (and most other procedures and testing): I prefer posing open-ended questions. I do not want to ’lead the witness’ in any way. I want the patient to think about what they see and report to me without any clues from me. I had a patient who had spent time in another ofﬁce doing VT. As I began working with her on vectograms, I asked her to describe what she saw as I made changes in vergence demands. She told me that she already knew what was going to happen: ”It’s going get smaller and closer and farther and bigger,” she said. When I asked how she knew that, she told me that the therapist in the other ofﬁce (the ofﬁce in which she felt she made absolutely no progress with her intermittent exotropia) told her beforehand what she was going to see. The problem was that she was unable to localize the target. Every time she attempted to point to where the image was, it would go double. She might have known intellectually what she was supposed to see, but she had never actually experienced the interaction necessary to really know what she was doing visually (both mentally and tactually), all of which is critical for integrating what goes on in the ofﬁce with real life needs and demands. Eye movements are probably the most basic visual skill. Accurate, consistent, effortless eye movements are critical in dertermining where things are and what they are˚ and then guiding our actions in response to that information. There are many possible ways to work on eye movements, but I cannot imagine anything better than a face-to-face approach. The eye movement procedure I do is derived from the work of Bruce Wolff, OD and the Behavioral Vision Project, which has been carrying on the legacy of Dr. Wolff. Wolff wands (Figure 4) are the object of choice for several reasons. They are shiny and therefore attention-getting; the patient can ﬁxate on their own small reﬂection in the ball, a distinctive and excellent accommodative target; and the ball is small enough not to get in the way of direct observation. Pursuits and saccades are done monocularly and then binocularly. It is also useful to perform pursuits and saccades with vertical dissociating prisms. My version of pursuits is to move the ball in Z-axis circles along the horizontal, vertical and 35˚ and 145˚ diagonals. The movements are slow and smooth, typically moving between three and twenty inches from the patient along the Z axis. I like to include some pursuits across the midline when doing saccades, which are also mostly movements through the Z axis. The patient is seated on an adjustable-height swivel stool with both feet ﬂ at on the ﬂoor or on a footstool. They are instructed to sit up straight with the head straight with their hands placed palms-up on their knees. And ﬁnally they are instructed to keep their head still as they follow the ball wherever it goes. Our job is to observe the person’s ability to follow the target accurately, smoothly, and easily and to discern their ability to sustain the pursuits. How is the body posture as time goes on? Head posture? Is there motor overﬂow? Excessive blinking? Overshoots or undershoots? Frequent ﬁxation loss? Are the pupils reacting appropriately? Are the two eyes similar in function? Do they work together properly? With the vertical dissociating prisms: Are the eyes pointing properly? Are the images aligned, and does this vary with viewing distance? 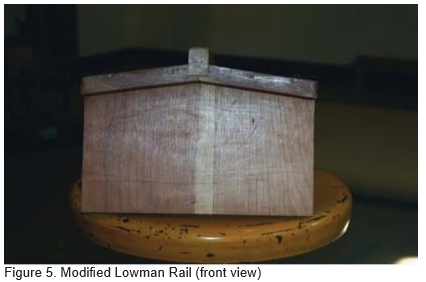 This is best done with a modiﬁed Lowman Rail (Figure 5). Lowman’s original version of the walking rail had a 20 degree slope from the middle to the sides. The modiﬁed version has only about 7 degrees of tilt. There is a raised center strip running down the middle. The Lowman Rail is designed to give proprioceptive feedback from the feet through the leg muscles. This feedback gives heightened awareness of balance (or imbalance) as we walk. The rail is raised off the ﬂoor about 6”, which increases the demand. A full-length mirror faces the end where the patient ﬁ rst steps onto the rail; there should be a few feet between the end of the rail and the mirror. The mirror eliminates much of the spatial distortion experienced by most people wearing 15 pd yoked prisms. Without shoes on, and preferably without glasses, the patient is instructed to ”look into the mirror, step onto the rail with one foot on either side of the center bar, get steady, walk to the other end while watching yourself in the mirror, and then step off at the other end. Turn around, get back on the rail looking straight ahead (there is no mirror at the other end) as you walk back to where you started and step down.” Do this 5 times with each pair of glasses described below. If a patient has trouble remembering how many trips they have made, 5 objects can be used to keep track by moving one on each trip. When they have moved all 5 objects, then they use the next pair of glasses. Four sets of 15 pd Yoked Prism glasses are used in the following order: Base Down, Base Up, Base Right, Base Left. This order goes from least disruptive to most disruptive for the majority of people. The prism power was chosen by Bruce Wolff because 15 pd is difﬁcult to ignore. I typically have people start without any glasses to get acclimated. The order of the prisms will change once the individual seems comfortable with the initial sequence. You want to observe posture, balance, and where they are looking. I will typically engage them in dialogue of some sort. What do you notice about these lenses? Do they affect your balance? Where are you looking? Responses can be quite varied and are usually informative.